» nRF24L01+ does not transmit.. I searched through the net and after reading a very good Brennen's tutorial on the nRF, found a simple and straight forward code on the net that is just the bare-bone code that is said to work. Please see below. The receiver side register settings and output is below. The receiver side code is given below. Checked the FIFO status of the transmitter just before it transmits. It is as follows. Till TX_DS is set, I am not sure if the data is transmitted. Please find pictures of the boards below. Do the length of the jumper wires matter? The pics are not good, but you can get the idea. ATMEGA8 Board with NRF given below. The nRF24L01 units are meant to be powered at 3.3 volts, but I see your have declared F_CPU at 16 MHz which is a frequency on the megas requiring 5 volts. Do you have a separate 3.3 volt supply for the nRF24L01s? Your code is hard to read since you don't use any of the nRF register names. It's easier to start with simple settings - no AA & no CRC to verify the modules work. Another debugging tip is to put a LED+resistor between power & IRQ on the modules, so you can see if/when the tx and rx irqs fire. You can safely tie CE & CSN to simplify the code and wiring. You can also tie CE high, but to switch between Tx and Rx mode you'll have to power down (set the PWR_UP bit to 0). Yes Ross - There is a 3.3V supply available on the Atmega328P board and I have connected the nRF board to that supply. Thank you, Ralph. I understand and to mellow that issue, I have added comments on each of the settings line. Guess it was not enough.. Sorry about that :(. The data sheet of nRF and SPI seems to indicate that CE pin is active HI and CSN pin is active LO - Not sure if those can be tied. I can give a try on the LED for the IRQ option to check the IRQ being fired. 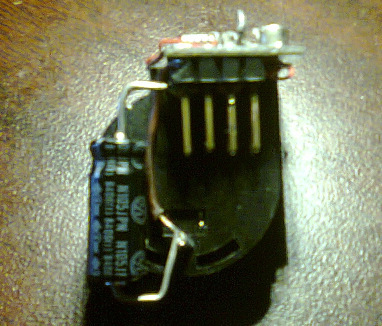 One other option is probably to check the logic of the IRQ pin with a logic analyzer. Thanks for the link - let me go through the discussions and see if I chance upon something. I have replaced the raw hex with the nRF register names. Hope that simplifies reading of the code. Update: I have replaced the raw hex values with its corresponding NRF register names.. Hope it improves the readability of the code. Yes, so when the CE pin goes inactive, CSN goes active and vice-verse. I've tested both CE tied high and CSN & CE tied together. With CE tied high, you can poll the Rx fifo without dropping out of Rx mode(and possibly missing a packet). With CE & CSN tied, you can switch between Tx & Rx mode quicker (~130uS) since you don't have to drop to power-down mode first. If you use the Rx IRQ, then tied CE & CSN is probably the best option. Thank you, Ralph. Yes - makes sense - as the number of CE transitions are by far less than those of CSN and keeping CE HI along with CSN does not alter the scenario much. My scenario is that one board transmits the packets continuously and the other tries to read the packets continuously - implying that the transmit board is in TX mode only and the receiver board is in RX mode . Am I doing it right? This sets bit 0 (PRIM_RX) and bit 3 (EN_CRC), but not bit 1 (PWR_UP). To receive it needs to be powered up. If you used an existing lib, or at least the register definitions from an existing lib it would be a lot easier to read, "writeRegister(CONFIG, (1<<PRIM_RX) | (1<<EN_CRC))". It would be easy to see that you forgot PWR_UP. If I have time I'll whip up some Rx test code and post it for you. Going through your blog, I see that you use Mirf library. I have used Mirf library, RF24Master library, Davide Girone library, Elecfreaks Arduino nRF TX and RX code and nothing worked for me. I finally found this RAW nRF TX and RX code and altered it to my settings. Jumping a few lines down from the CONFIG setting statement that sets it to 0x09, there is another CONFIG statement that sets it to 0x0B (0000-1011) where the power up bit gets set. However, I executed the code the code by setting the first CONFIG setting statement to 0x0B (enabling power up) - the results were the same. I have listed the TX and the RX code above. I am struggling to get the TX happen first and I have the issues mentioned above. I am currently not seeing any indication that the payload has been transmitted (TX_DS bit does not set indicating a successful transmission). I would like to have a piece of code that does a successful transmit first. If a Logic Analyzer trace is available (traces of SCK, MISO, MOSI, CSN and SS - (IRQ optional)) - it would be great. I connected the IRQ pin of the nRF to a logic analyzer to see if it goes LO when the transmit happens. It stays HI forever - indicating nothing was transmitted. The STATUS register and FIFO register indicate that in the first two cycles the FIFO Register has TX buffer space and from the third cycle the TX_FIFO buffer is full and this is reflected in the STATUS register as well. Something is preventing the transmit from happening. There are several proven libraries. I suggest that you choose one and then follow instructions meticulously. 1. download the original library into another directory. 2. 'diff' your files with the virgin distribution. 3. post a link to the original distribution. 5. provide an explanation of your problems in English. This approach applies to most things in life. It is more likely that a reader chooses to build your project. You are more likely to get help. But most likely, you will see where you made a foolish edit and correct it yourself. Posting reams of 'your' code will not produce great response. I am not going to 'diff' it myself. Especially when I don't know where the original came from. And I certainly don't want to read through hundreds of lines. Yes, I think that the Brennen tutorials and examples are well written. I started from these. From memory, the examples are not written for AVR but are easy to port. Thanks David. As I mentioned I have tried a set of libraries and unfortunately that did not work. I got hold of this code from Sparkfun forum where a member pointed to his code - link below. It is a test code written for PIC C18 and I had to modify it for AVR. Modified the virgin code again today with minimal changes - majorly changed was the SPI setup routine and it's corresponding #defines (PIN references) as it was PIC dependent. Brennen's has put in effort to make the program as flexible as possible and has lots and lots of code with generous comments. I want to test the set up with something a lot simpler and the test code at the link above seemed reasonable to start with. 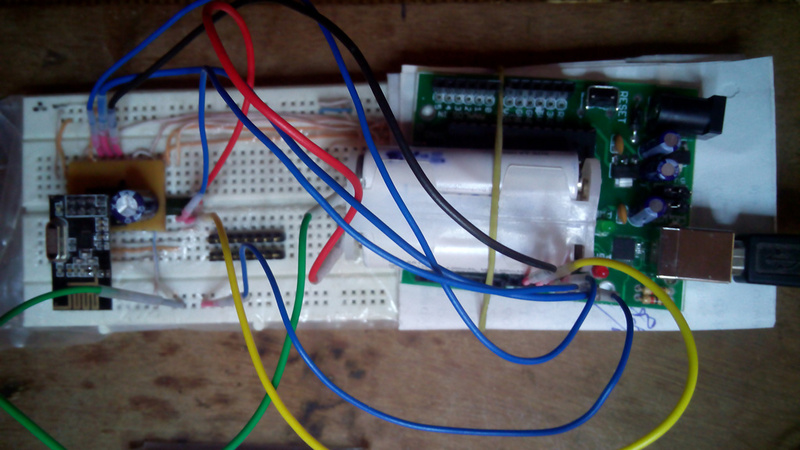 The simplest to compile and run was the arduino code that was posted at http://www.elecfreaks.com/203.html. At the bottom of the article there is a download link - Download nRF24L01_Demo_For_Arduino_v1.1. that downloads a zip file with a TX and RX codes. All I had to change was the PIN references. Even that did not work. The TX board and RX board printed the STATUS register as 0E and that was it. Code walked and found that TX board was waiting for the TX_DS bit of the status register to be set to indicate completion of transmission and that was not happening. Since TX was not complete there was nothing to be received by the RX board. Solder smd 1uF and 10nF capacitor on nRF24l01 pin header and place a 10uF capacitor on breadboard. The nRF board has a 10nF and a 470uF capacitor between the VCC and GND on the nRF board to smooth out any spikes. Isn't debug mode for code execution tracing and to see the status of the AVR registers, memory and stacks? I seem to be having problems with the nRF and debug may not help. // wait for mirf - is this necessary? This is my test transmit code. 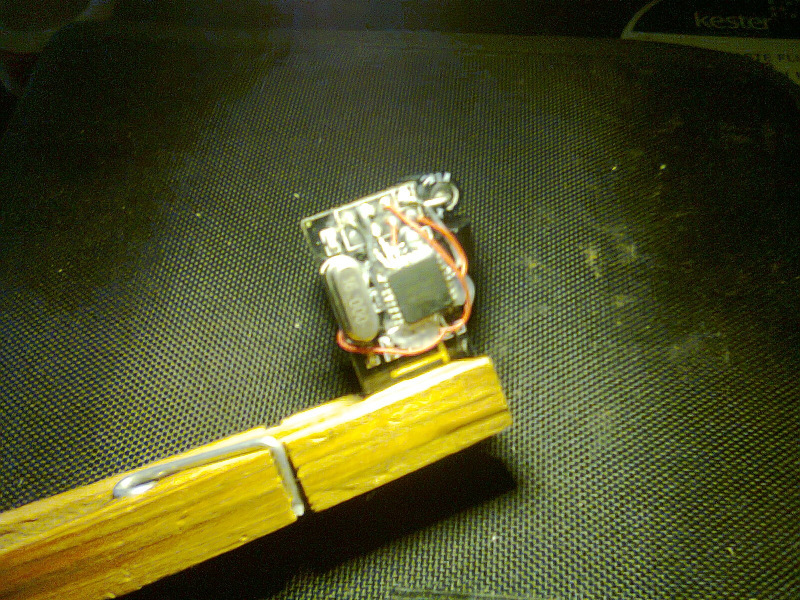 It worked fine with a t88 piggybacked on a nrf module with CE tied high, powered by a CR2032. My God! Ralph. You took all the trouble. Thanks a million. 1) The nRF powerup is done only once in the nRF init. 2) Delay after config register is written for power up - I am using a 50us delay. This was something I had already done, so it was just a matter of digging up the code and posting it. It's not necessary to power off between transmits. I do this to reduce power so it will run on a cheap CR2032. A good quality (i.e. Duracell or Panasonic) CR2032 can put out ~20mA sustained, but the cheap ones I have drop below 2V when the current gets much over 10mA. With the 20uF cap there's no problem powering up for a transmit once per second. What version of mirf library are you using? Erros pop up on the following functions that are referred in your code. Too low decoupling capacitance. 470uF is too big (= slow) and only one 10nF is too poor. I solved with 4 modules adding SMD capacitors like said. Debug mode disable optimizations of compiler that can cause subdole bug. Please use strong power supply with ability to supply 100+ mA, not watch battery, to make system initially works. Ok! Downloaded the tinkerer nRF library. Will give it a try. Thank you, flz. You make some good points. Electronics not my strong point. I will replace the capacitor with a lower one and check. Yeah!! Debug mode disables the optimizations - will give that a try. There are some switches too that disable the optimizations - let me check on that too. As regards to the power supply, I am using two AA eneloops charged (2000 mAH) - I guess that should be quite strong. Not only lower values, smd MLCC or tantalium capacitor. Better if not Y5V dieletric. Changes that I made are marked in red. Does not work. The status register returns 0x0E => 0000-1110 => TX_DS is not set and TX_FIFO is not full. Please see the Logic Analyzer trace for info. Channel 4 is CE and Channel 5 is IRQ (Constantly HI in the picture). 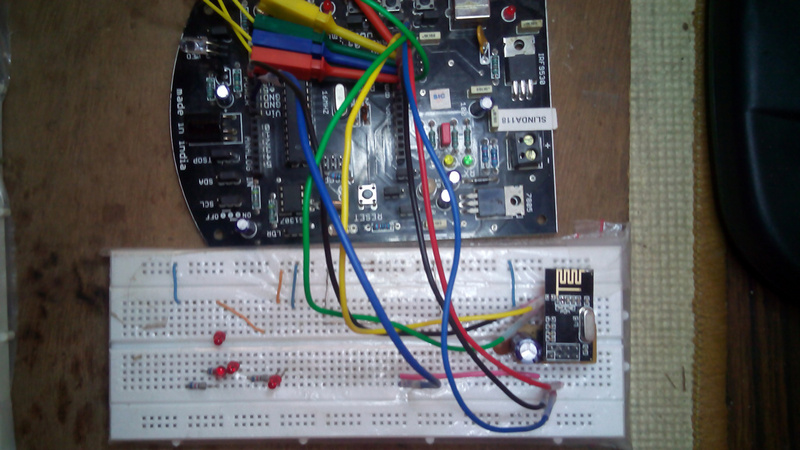 Executed the program on a 328P board and a Atmega 8 board. Results are the same as regards to TX_DS (does not set). I have replaced the 470 uF with 10uF Electrolytic capacitor (not SMD). Capacitor should be near to the IC. View attached images with cap on pin header. 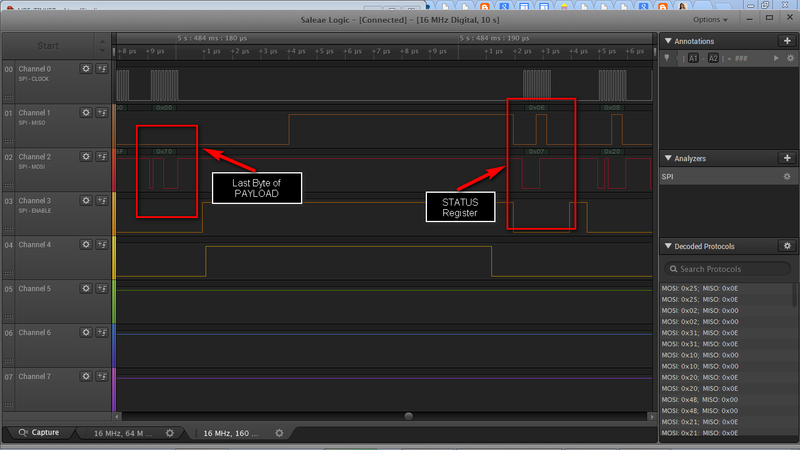 Status register 0x0E is default value, sure that module does not reset itself due to power spike? Again fix it with smd cap on pin header. Wow! So close and so small.. That is delicate work!!!!!! I guess I have to get it done by some guy with a delicate hand! Your board looks a wee bit different. Attached an electrolytic 1uF capacitor between the GND and VCC on this board. As well as I got a power supply to deliver regulated 3.3V to the transceiver... No Luck!! The only option left is to try the SMD capacitors !!! Update : The IRQ trace seems to have appeared - it seems to be pulsing with each payload transmit!! However the status register still reads 0x0E!! Exploring further...! Thanks a lot to Ralph for your suggestions and code, David for your suggestions on How-to-ask-questions and Flz for your insight!! Flz, I will try remaining boards with an SMD. Electrolytic 1uF worked for now!!!!! You're transmitting the same message over and over, and shockburst CLAIMS to check a 4 bit id field to know it's not just retransmitted after a lost ack, but it does not. Change your transmitted message on each send, and your receiver will see them. I often just add a "Message Number" byte than increments each time I send the message. Changed the content of the packet. First packet is "ABCD", second packet is "EFGH", third is "HIJK".. and so on and transmit each of the packet at 100 ms intervals. Auto ack is not enabled on the receiver or the transmitter - just blind send and receive. Auto ack is a feature of Enanched Shockburst that is enabled by default on nrf24l01 and PID (packed id) is auto-incremented and is not related to payload. To improve communication use 2 byte CRC and set an address with bit that change a lot. Remember to change from TX to standby or RX every 4ms (internal TX PLL is open-loop and need to "recalibrate") like the datasheet say. Even with EN_AA = 0 (which means no 9-bit packet control field added), the receiving nRF will drop duplicate packets? Set the register EN_AA = 0x00 and ARC = 0 to disable Enhanced ShockBurst™. But since EN_AA is per-pipe, and ARC is global, is it possible to have enhanced shockburst on some pipes and not others, with ARC applying only to those pipes with EN_AA? Haven't messed with disabling shockburst, all I know... if you send the same packet over and over, you'll only receive it once. If you make something in the packet change, you'll receive it most of the time. Of course, any packet can be lost at any time. You have to keep this in mind. But the thing works 'cause the vast majority of packets are received. Hi Ravi, I have the same problem with you. my nrf can't transmitting. in your case, the problem is the capacitor on vcc and ground or the code? I have tried not use auto ack, but still no luck. what capacitor do you use? Note that the last post from "Ravi" was going on for three years ago ... ! can anyone tell me what power source that suitable for NRF24L01? Any 3V power (2 AA Duracell batteries) should work!! If your uC board has a 3v3 output even that can be used. Sorry about the delayed response. I should be getting these posts a mails in my gmail - for some reason that did not happen and I missed this post. ​The Capacitor is 1uF capacitor soldered on the NRF board itself - between the GND and the VCC pins. That should work! Thanks ravi for your responses. Now i have problem with my receiver. It was working once and after i changed the data to be transmitted, my receiver only received three times. Could you send me your receiver code for my reference? What kind of cap do you use? Elco, tantalum or SMD? Elco, tantalum or (sic) SMD? Both Elco & Tantalum are available as SMD!! Thaks ravi for your responses. Now i have problem with my receiver. It was working once and after i changed the data to be transmitted, my receiver only received three times. Could you send me your receiver code for my reference? Why do you keep repeating exactly the same post: #41, #42, and now #44 ?! ​Apologies again!! For some reason, I am not getting alerts from this BB.